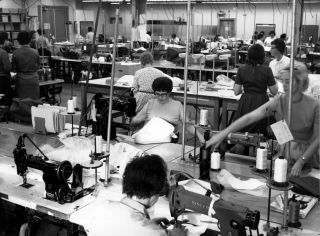 International Latex Corporation (ILC) seamstresses are seen in 1967 sewing parts for the Apollo spacesuits worn on the moon. From the studio that put Sandra Bullock in a spacesuit may now come a movie about the real-life seamstresses who traded sewing brassieres for stitching Neil Armstrong's lunar wardrobe. Warner Bros. Pictures, which this fall will release Alfonso Cuarón's Bullock-and-George-Clooney-as-astronauts sci-fi film "Gravity," has hired screenwriter Richard Cordiner to adapt the non-fiction book, "Spacesuit: Fashioning Apollo" for the big screen, the Hollywood news website Deadline reports. "Each one of [the spacesuits] was completely handmade — this [was] an utterly couture garment," de Monchaux told National Public Radio at the time his book was released. "Twenty-one layers of all different kinds of material hand sewn by women who came off the bra and girdle assembly lines." "When you look at how Playtex put these suits together, it was this really kind of fabulous combination of, on the one hand some engineering expertise, but on the other hand, an enormous amount of informal knowledge," remarked de Monchaux. The cover art for "Spacesuit: Fashioning Apollo" by Nicholas de Monchaux. The book is being adapted for a Warner Bros. Pictures' movie. If the story of a group of seamstresses and their unlikely supervisors — a TV repairman-turned-spacesuit engineer and a former sewing machine salesman-turned-executive — seems devoid of the type of drama needed for a movie, "Spacesuit" recalls their triumph over the military-industrial complex to produce what in July 1969 became the most iconic outfit worn in the history of mankind. "One of the most remarkable stories is when Playtex was indeed successfully edged out of the [spacesuit selection] process at one point in 1965 and then battled its way back into a six week competition between three companies that would produce the final suit that would walk on the moon," de Monchaux told NPR's "Science Friday" in 2011. The screenplay for "Spacesuits" is Cordiner's first script in a two-film deal with Warner Bros. A brand strategist for a San Francisco advertising agency, Cordiner's spec script for a documentary about the making of the classic Steven Spielberg movie "Jaws" drew the studio's attention. "Still can't believe I'll help tell this incredible story ... such an honor," Cordiner wrote on Twitter on Wednesday (May 22), referring to "Spacesuits." If the project reaches theaters, it will not be the first time that Warner Bros. has borrowed from space history for a movie. The studio distributed the 1983 film adaptation of Tom Wolfe's "The Right Stuff" about the original Mercury astronauts and backed the 2000 stateside release of "The Dish" about Australia's contribution to the Apollo 11 moon landing. Warner Bros. and Clint Eastwood acquired the film rights to astronaut Neil Armstrong's authorized biography, "First Man," by historian James Hansen in 2003, but then let the option expire four years later.